Bob Dylan (born Robert Allen Zimmerman) (b. May 24, 1941) is an American folk rock singer, singer-songwriter, poet, and painter, who is known for his nasally vocals and harmonica playing. He is one of the towering figures of 20th century popular music. He was also an influential figure in 1960's counter-culture. He is by far the most-cited songwriter in American judicial opinions. Dylan, a convert to Christianity, has affected music and culture for five decades. He won the Nobel Prize in literature in 2016. Q: You're a literal believer of the Bible? Dylan: Yeah. Sure, yeah. I am. Q: Are the Old and New Testaments equally valid? 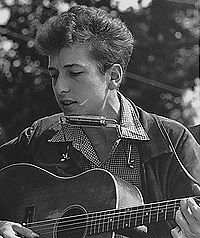 Born Robert Zimmerman in Duluth, Minnesota, Dylan grew up in Hibbing and left to attend the University of Minnesota in Minneapolis. It was there that he developed a deep interest in folk music, listening to the recordings of artists such as Odetta and Woody Guthrie. In 1961, he dropped out of college and headed to New York City, where he became part of the burgeoning folk music scene in Greenwich Village and eventually landed a contract with Columbia Records, for whom he still records today. His first four studio albums established Dylan as a major voice within the developing protest counterculture of the early Sixties. It was Bringing It All Back Home (1965), however, that propelled him to international fame and stardom. To howls of protest from his devoted "folkie" fans, Dylan "plugged in" for the first time and the album's glorious fusion of electric guitars, driving rock rhythms and his unique lyrical style set a benchmark to which all other artists aspired. He arguably never scaled these heights again, especially in terms of producing an album of such consistent quality and musical completeness. His next three albums are rightly highly regarded, but after these his output became of increasingly variable quality and Blood On The Tracks (1975) is his last album from his classic period to be highly regarded by rock critics. In 1979, Bob Dylan surprised many by announcing he had accepted Jesus Christ as his personal savior. Biblical references had never been missing from Dylan's lyrics. His third album featured such lyrics as "and the first one now will later be last" as well as "and like Pharaoh's tribe they'll be drownded in the tide, and like Goliath they'll be conquered." The album John Wesley Harding is suffused with Christian imagery, and a religious conversion is implied in several songs from Street Legal, the album released in 1978. It was not until 1979, however, that Dylan made his conversion official by releasing an album of Gospel music, Slow Train Coming. "Gotta Serve Somebody" became a hit single, and Dylan embarked on a tour in which many of his older, secular fans booed him while he attracted a new generation of Christian fans. His next two albums, Saved (1980) and Shot of Love (1981) were also Gospel albums. There followed a two-year period of no new releases while rumors floated that Dylan had returned to the Jewish faith of his upbringing. He resurfaced with a new album in 1984, Infidels. The secular/liberal music press accused the lyrics on Infidels of being "cranky" and right-wing: "Neighborhood Bully" defended Israel's foreign policy vis-a-vis its Arab neighbors, "Man of Peace" had the refrain "Sometimes Satan comes as a man of peace", "Union Sundown" supported buying American goods and decried imports from the third world, and the hit single "Sweetheart Like You" included the line "a woman like you should be at home, that's where you belong". The opening track of Infidels, "Jokerman" is constructed almost entirely of Biblical allusions. These four albums stand as an interesting period in Bob Dylan's career of Christian lyrics. However, he has not released an album only of explicitly Christian songs. He has continued to release new material since, of varying quality and commercial success. In 1997, he released the well-received album Time Out Of Mind; a live performance of a song from the album at the 1998 Grammy Awards was interrupted by a liberal performance "artist". In 2004, he published the first volume of Chronicles, his planned autobiography. Since 2005, he has had a weekly radio show on XM Radio called Theme Time Radio Hour, and he chose the Bible as the theme of a recent show, playing songs by the Reverend J.M. Gates, Kitty Wells, and the Reverend Gary Davis. His 2009 album Together Through Life reached #1 on the pop music charts; at age 68, he is the oldest artist to have attained that mark. Later that year, he released an album of Christmas songs Christmas in the Heart which included a mix of religious hymns and secular tunes. He has stated that he is a true believer and able to sing the religious songs as such. He has opened many concerts in recent years, with a song about changing his way of thinking to follow Jesus, including his 2011 concerts in Israel, Vietnam and China. ↑ Justice Antonin Scalia once copied a line of Bob Dylan's lyrics without attributing credit to him. ↑ This song sparked a fairly comical response song by John Lennon emphasizing what he felt to be a prerequisite for serving others called "Serve Yourself". Lennon shaped the song for possible inclusion on an album, but never got past playing varying versions of it solo on the piano. This is a normal practice in the music industry, a practice that, in addition to developing a version with the right feel for the song (called a "demo"), records nuances of the song that appear in this development to ensure they are not forgotten. At least one version's lyrics included the phrase, "don't forget to serve yourself", indicating the song was aimed at people already serving others (surely including some in obedience to God)—even to the point of forgetting their own needs. ↑ By turns surreal, poetic, visionary and political. This page was last modified on 29 March 2019, at 14:51. This page has been accessed 27,141 times.